The UK’s carbon price floor mechanism has proved very effective at securing cost-effective emissions reductions. It offers lessons for other carbon pricing schemes. I have previously pointed out some of the flaws with carbon pricing schemes, notably the EUETS, so it seems appropriate for balance also to look at an example of carbon pricing working well. There are few more successful examples of carbon pricing, or indeed of climate change policy generally, than the UK’s carbon price support (CPS), which in effect tops up the carbon price set by the EUETS for UK power generation. It has been an essential element in securing large scale, cost effective emissions reductions over the last few years, mainly by incentivising a switch from coal to gas. 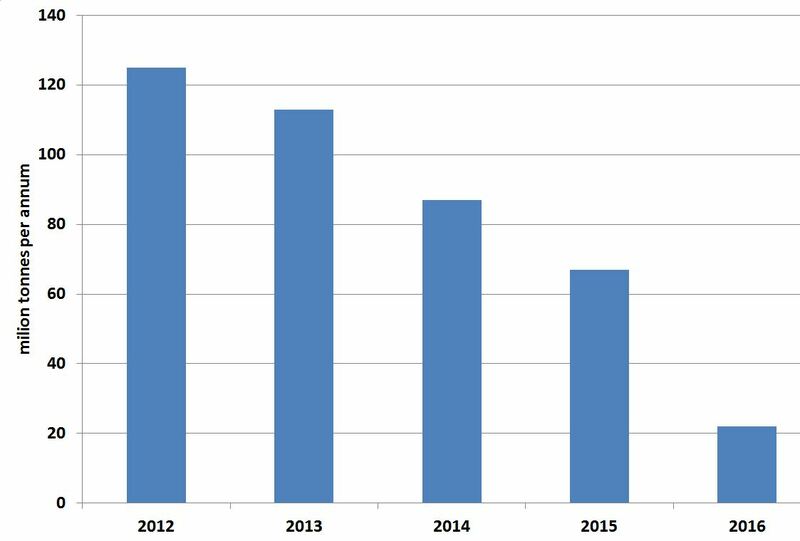 Source: EUETS data, 2016 estimate by Sandbag. The reduction in emissions from coal has been due to a range of factors, including the age of the UK’s coal plant, almost all of which dates from the 1960s, regulation of other pollutants, falling demand, the growth of renewables and low gas prices. But a good deal of the reduction has been due to the CPS, especially in the last two years, when its level has been increased significantly. 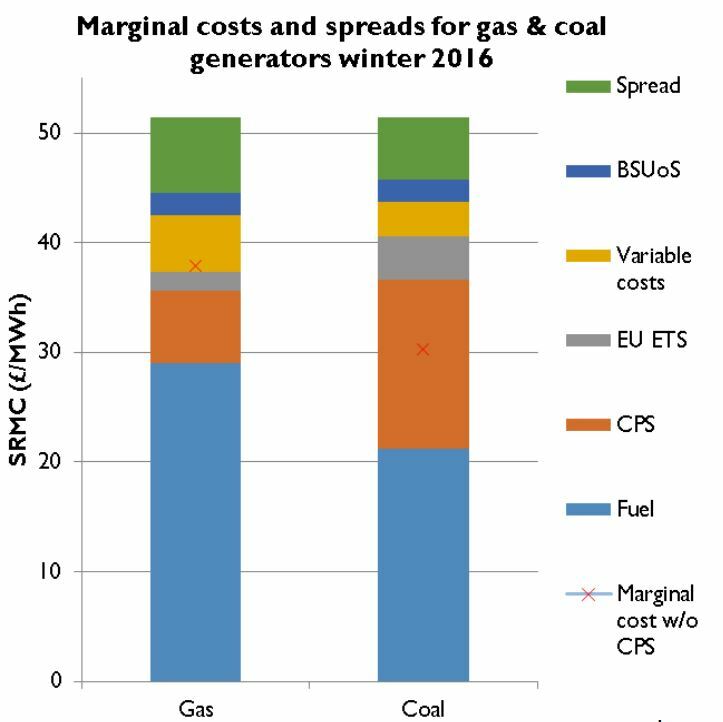 The carbon price floor (EUETS plus carbon price support) has led generation from gas to be cheaper than that from coal. This is shown in the chart below from Cornwall Consulting. The red crosses show the costs of generation without carbon price support. Coal is cheaper than gas (around £30/MWh vs. £38/MWh). However with the carbon price in the order is reversed. Gas becomes cheaper than coal, so tends to run more. Coal stays on the system due to the capacity price, providing system security, but runs much less. This has been achieved with a carbon price that remains quite moderate. It is little more than half the cost of the damages caused by emissions (the social cost of carbon, see here and reference therein), and in line with or lower than a range of other carbon taxes (see the recent World Bank Report p.27 ). The carbon price floor also has a number of other advantages. For example, but increasing the price of fossil generation it makes onshore wind more competitive. Onshore wind is the cheapest form on low carbon power in the UK, and receives no subsidy at present. It has been argued that the emissions reductions due to carbon price support are not retained due to the presence of the EUETS cap, but this is not true in practice (see previous post here), with the vast majority of the reductions retained in full. However it would be much better still if there were an EU wide floor price, and the EUETS price were at or above the current UK carbon price. This UK experience shows a number of things. Firstly carbon pricing can be effective even at fairly moderate levels. Second, fuel switching can indeed offer substantial, low cost abatement in the short to medium term even if it is not enough in the long term. Third, a lower bound on price is useful in an ETS – these reductions would not have happened as a result of the EUETS alone. Fourth, system security is consistent with emissions reductions if coal is kept on the system for a while, but does not run much. The UK government is understood to be reviewing the role of the carbon price floor at the moment. In view of its effectiveness and the example this sets for other jurisdictions, the government needs to ensure that the price is maintained at a minimum of its current level, and extended beyond 2020. This entry was posted in Climate change policy on 09/11/2016 by adamwhitmore.